We are perfectly located within Dubrovnik city walls you will feel like living inside a castle). 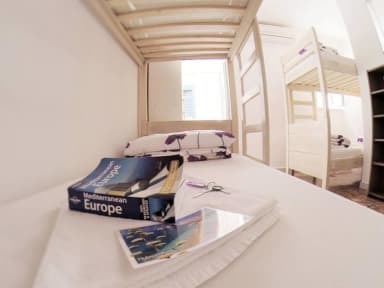 Staying here you will have endless possibilities to enjoy within walking distance as the hostel is situated seconds from all attractions of Old town of Dubrovnik. In a 400 year old building we have a lovely common room, fully equipped kitchen, a terrace overlooking old town's red roofs and most importantly, comfortable beds in small but cozy and air conditioned rooms. We provide lockers to keep your valuables (bring your own lock). Our location is fantastic, guests can enjoy a stroll along the Stradun the main street, have a ride in a cable car and admire panoramic views of the city or take a kayaking tour around city walls. Staying here you will have endless possibilities to enjoy within walking distance as the hostel is situated seconds from all attractions of old town of Dubrovnik. We make sure our guests have great and authentic experience by organizing many social activities, like sunset tours, wine nights, cliff jumping, kayaking, day trips and many more. Set in a 400 years old building Hostel offers refurbished air-conditioned dorm rooms small but cozy shared rooms; 4 bed and 8 bed mixed dorms), bathrooms, bunk beds with reading light and electrical outlets, lockers to keep your valuables and bring your own lock or buy one at reception, new comfortable mattresses and soft linen. Other facilities include lovely common room, fully equipped kitchen, a terrace overlooking old town's red roofs. Fully equipped kitchen lets you prepare your own meals and meet other travelers! Terrace with most beautiful view is great place to share your travel plans with fellow travelers and to enjoy in the afternoon beer! CANCELLATION POLICY: 72 hours before arrival date. If you cancel within three days of your arrival date, you will be charged a late cancellation fee equal to your first night’s accommodation. If you cancel on the same day that you are meant to arrive or are a no-show, you will be charged a no-show fee equal to the first two nights of your booking. We are ideally suited to solo travelers or small groups who wish to mingle and meet people. Therefore, WE DO NOT accept bookings of groups larger than 8 people. If you choose to make a booking for your group, we reserve the right to cancel your booking without a refund of your deposit. This policy also applies to multiple bookings under different names for the same group. If you arrive at the hostel in violation of our group policy, we have the right to cancel your booking on the spot without refund of your deposit as well as charging additional cancellation fees. CHECK IN: from 14:00 to 23:00 . CHECK OUT: before 10:00 . PAYMENT: upon arrival by cash only - in Kuna or EUR. Our normal reception hours are from 8:00 to 23:30, if you plan to arrive outside of these hours, please contact us by email. Wonderful experience in Dubrovnik thanks to all the assistance from the staff about what to do and where to go. Highly recommend this hostel. Fantastic hostel, great staff, and really clean. Have stayed there twice now and wouldn't hesitate to stay again! They put on good social events (if you want to attend) too. Good hostel, and the patio was really nice to chill on. It was a bit difficult to meet other solo travelers, but I was also here in the off season, so I expect that the summer will be more lively. Overall I had a nice stay. I loved this hostel! I was in a private room (ended up being a private 8 bed dorm, but that was cool too) so I was located in the annex building about a 10 minute walk from the main hostel. Where I was staying was extremely clean with very nice bathrooms and a kitchen. The hostel puts on events almost every night so meeting people was very easy even for a solo traveler. Its not overrating if i say this is one of the best experience i got in Hostel word booking. The staff is amazing, they make you feel you are part of Dubrovnik.They helped a lot with local information.And one of the best things about this hostel is they have gatherings for people staying in their hotel, once in 2 days, which is one of the best way to know people.I would strong recommend this hostel and i am sure i am going to stay here if i go back to Dubrovnik. Lovely hostel, we were placed in the 2nd location which is in the perfect location and staff was quite nice and attentive. Certainly a great choice for location as well as peace and quiet at night. Only stayed for one night as making way down coast but wanted to experience Dubrovnik! Ideal location in old town, staff sent detailed instructions for easier route (less stairs!) Room was on smaller side but adequate and appreciated having the small bathroom. Staff is great. Kitchen in the main house is tiny. 105ish steps up from the bottom of the city can get old. Common room closes at 10pm. City it's self is ridiculously expensive.